As we move into this year’s presidential election, the tempo of dramatic world events and developments that are breaking daily is mind boggling. Every single day we are seeing more outrageously desperate actions on the part of the globalists and their US government minions. Among the latest unfolding developments this week all fast tracking towards world war against Russia is NATO’s violation of international law deploying AWACS (Airborne Radar Warning and Control system) in Syria despite only Syria and Russia possessing the legal right to control the embattled country’s airspace. With both US and Turkish boots on the ground in northern Syria and US led coalition airstrikes regularly invading the sovereign nation’s airspace, recently targeting Syrian soldiers and plans to kill more, along with former acting CIA director Mike Morell’s recent call to begin killing Russian soldiers, the latest warpath rant comes from Army Chief of Staff General Mark Milley who is now threatening Russia (as well as China and Iran) with nuclear war. Spoken just like a true grade school bully on a playground, he boasts, “We will beat you harder than you have ever been beaten before!” This is the kind of moronic leadership that rises to the top of the Empire food chain? I’m afraid so. The most likely next commander-in-chief is Hillary Clinton. She’s already made it very clear that any real or perceived cyberspace attack on America coming from anywhere in the world constitutes an act of war and a military response against the cyber-perpetrators’ country. After already vowing to bomb Iran and with her constant accusations blaming Putin for everything gone wrong in her life, including exposing her DNC corruption scandal responsible for rigging her presidential election, she is also all but promising to launch World War III against nuclear powered Russia. Incisive insider Paul Craig Roberts and even Putin have both said so. The neocon insanity that she represents is committed to perpetrating both suicidal and genocidal mass murder. With a total of 7,100 US nuclear warheads as of August 2016 and an estimate reported two years ago of 2,150 operationally deployed nukes, America could destroy itself four times over while Russia’s 7,300 nuclear weapons would likely carry the same tremendous overkill power. When we’re all dead, it hardly matters who has what? The sheer madness in control of our planet right now actually believes the elite can simply hunker down in their underground luxury bunkers, take a long nuclear winter’s nap and a few years later emerge like Rip Van Winkle unscathed in their grandiose fairy tale. Talk about madness! Meanwhile, a whopping 40 million Russian citizens taking US threats very seriously are currently undergoing a WWIII practice drill in preparation for the real thing that the US megalomaniacs are bent on igniting. But unlike the US, Moscow is also taking care that at least12 million of its citizens in their capital will also safely submerge into a subterranean world when the SHTF. Assad is reminding the world that the US Empire refuses to accept a balance of power sharing hegemonic interests with the two most powerful other nations on earth Russia and China. And invariably just when the curtain is lifted exposing the US crime cabal government that’s created and to this day still supporting al Qaeda and ISIS terrorism around the world, the wag the dog propaganda frenzy goes into overdrive to falsely vilify Putin and Assad for actually being the two biggest fighters of terrorism on the planet. But then peace and harmony is not what the New World Order agenda’s about. The globalist puppet masters pulling Washington’s strings are simply setting the stage to destroy the West in an orchestrated West versus East showdown at the doomsday corral in order to obfuscate the collapse of their house of cards, theft-based, debt-based economy that will be sure to usher in their long plotted one world government tyranny. 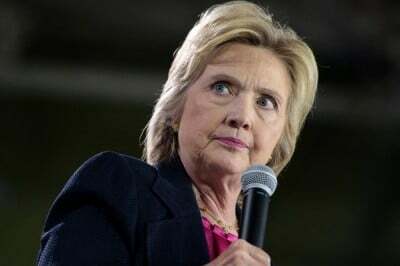 Do Americans really want to place their lives in the hands of Hillary Clinton, a political liar who possesses the capability to push the nuke button that would end the world?